Solihull and Birmingham RFC have announced they will appeal Solihull Council’s decision to stop them selling off their ground. Solihull and Birmingham RFC have announced they will appeal Solihull Council’s decision to reject plans to build 87 homes on their Sharmans Cross Road ground. The Bees held a crunch meeting on Thursday night to discuss the future of the club after grave concerns about their finances surfaced following the decision, with members of staff not having been paid for a weeks. In response, the management have appealed to all members and supporters to help the club get through this “extremely difficult time”, so it can look forward to its first year in the new RFU Championship league. “An appeal could take up to six months, however, there is still a possibility that we can reach agreement with Solihull Moors FC to commence ground sharing immediately, on an interim arrangement, which would be beneficial to both clubs,” said a spokesperson for the Bees. 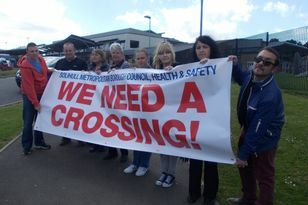 “We were disappointed by Solihull council's planning committee’s decision and discussions on how we can proceed have been ongoing with SMFC in the last two weeks. We are hoping that an agreement can be reached to allow us to play at Damson Park this season. The News revealed last week how the Bees were issued with a winding-up order for not paying the taxman on time - but directors managed to delay the payment until September. It came just days after the club had an exciting ground share proposal accepted by Solihull council, but the sell off to developers to fund the move was rejected at the same time. The rugby club hopes that sharing a ground and facilities with their footballing neighbours at Damson Park would make both teams more successful and create a sporting foundation for the community. While an appeal is being drawn up, the club is asking for financial help to see them through the year, and hopefully beyond. They added that the committee would like to “thank sincerely” all those who had contributed since their first appeal at the beginning of the year, and to apologise to any staff who have had income deferred. In a bid to keep the club safe in the short to medium term, by raising £100,000, the Bees are by appealing for more sponsorship and bigger crowds. BIRMINGHAM and Solihull Rugby Club last night held a last ditch meeting of club members to save the Bees from closure. SOLIHULL’s top rugby side held a crunch meeting last night as they frantically tried to sort out the short-term future of the club.